Why do you need commercial window tinting? When you hear the term window tinting, several things are likely to come to mind. Most often these concepts surround the darkening of windows in your home or perhaps your car, particularly for the purposes of protection from sunlight or for privacy. While both of these perceived purposes would be correct, the protection and benefits behind window tinting are numerous and extend to beyond simply individual homes and cars, but to large commercial buildings as well. 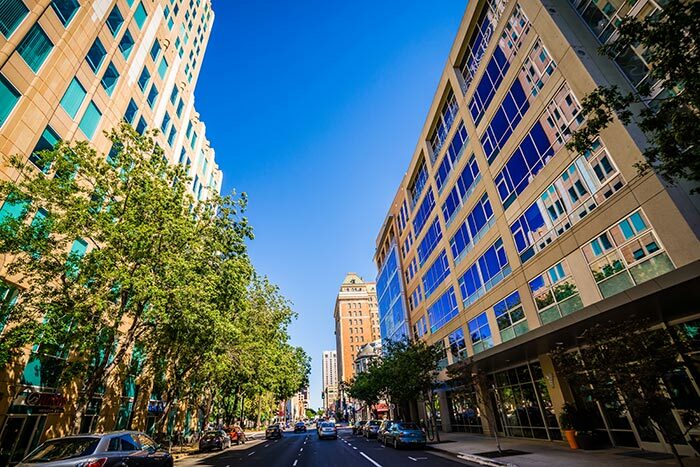 If you have lived in Sacramento for any period of time, then you may know that from July to September Sacramento holds the distinction of being the sunniest place on the entire planet! It is in these hot, dry summers that protection from the sun’s brutal UV rays is most critical, thus the investment in protection for both your property and for yourself is certainly worthwhile. If you are considering having your windows tinted, it is important to remember that although tinted windows are designed to protect and shield us from the outside elements, there are many additional benefits to commercial window tinting that you may not have considered. There are many benefits of high quality commercial window tinting for properties and buildings. Window tinting can reduce up to 85% of the heat from the sun and give 99% rejection of ultraviolet light and reduce 95% of the glare. Window tinting films also offer complete privacy during the day. Films come in varying degrees of light transmission so you can pick the window film that best meets your individual needs. Commercial buildings of any size will save money by maintaining a consistently balanced temperature. An immediate return on any window tinting investment will be realized when commercial films are installed because operating costs and monthly energy usage will be lowered. By window tinting your office, you can also enjoy up to 15 degrees of saved temperature from the film itself which translates into energy cost savings on air conditioning. Any sunlit environment is subject to temperature shifts created by glare, hotspots, heat and fluctuating temperatures. It’s important to keep employees, guests, clients and shoppers comfortable. Significant amounts of UV rays can be screened out with the installation of commercial window tinting by shielding the UV rays, glare and heat from entering your work environment. It will also soften the light, balancing the temperature and maintaining a comfortable work environment all year-round. Window tinting can protect valuable contents in your building. Did you know that the interior space of your office can experience damaging and harmful effects of UV rays and solar heat, such as fading of carpet, furniture, merchandise, draperies and equipment? Up to 99% of destructive solar heat and UV light can be rejected by window films, so your investments are protected; and by them lasting longer, your saved dollars turn into profits. One of the most vulnerable parts of your building is the windows and glass. Protection and safety in the workplace should always be top priority. Window films are available in security window film versions that are thicker and help hold the window glass in place if shattered. This feature can reduce the chances of burglary, damage to your property and even personal injury. Decorative window films give you the opportunity to make the best impression with decorative window films on your building or even in your home office. Commercial window tinting films offer a large selection of styles and designs to suit almost any environment that you want to add dimension or personality to within your space. The first consideration is for quality and not always price since a high quality commercial window tinting film will last for years. The old adage of “you get what you pay for” rings true in this area! Don’t fall into the trap of purchasing a low-grade window tin that will only last a couple of years. It will cost you more money in the long run, because you will have to replace it. As a family owned and operated business, TintMaster pride themselves on professional installation, high-quality materials, and unparalleled customer service. They have been serving the Sacramento area since 1989 and have built a reputation for excellence. If you need automotive, residential, or commercial window tinting, give the specialists at TintMaster a call at 916-852-8468.